The end of college is an exciting time for graduating seniors. There’s the anticipation for the new job, getting their own apartment, and finally being finished with school! However, you should be sure to educate your students about the responsibilities they’ll be taking on for the first time. Finances can get rather tight for young adults and student loans shouldn’t be taken lightly. For federal and private student loans, their first payments likely won’t be due until November, as there is a six month “grace period” from starting repayment once leaving school. Your student should understand the repayment terms and what responsibilities they face when it comes to student loan repayment. These are the top things to emphasize when preparing your graduating senior for student loan repayment. Even if you cosigned their loans, the loans are theirs and your student should be familiar with some facts. How much did they borrow? What is the interest rate? What are their repayment options? How much will they pay back? These are all questions your students should be able to answer. If they can’t, they need to go to their loan holder(s) to confirm the information. Most lenders have more than one repayment option. Your students should work with their lenders to find the repayment plan that works the best with their budget. If your student has private student loans, you likely had to cosign for them. A cosigner is an individual who is contractually required to repay the loan in the event that the actual borrower cannot or does not repay the loan. Some private lenders provide a cosigner release option. A cosigner release may allow the cosigner to be released from the loan if the borrower meets certain requirements. This usually includes on-time payments for 24 to 36 months and adequate independent credit and income to qualify. If a cosigner release is possible, you should discuss how they will work toward meeting the requirements. 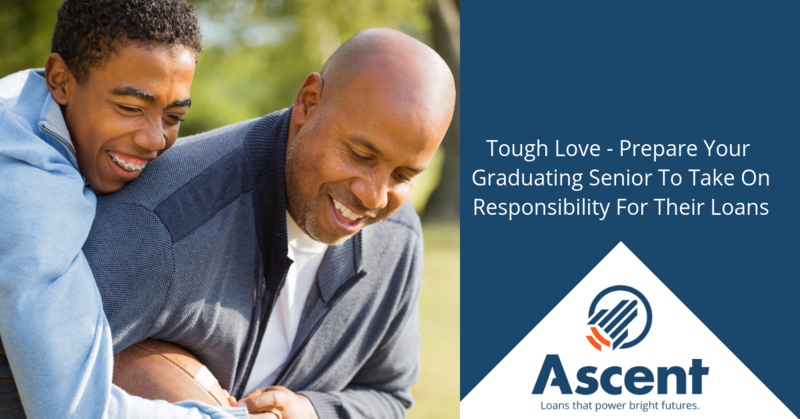 Remind your student of the education received from borrowing this loan and how your student will experience greater independence and less stress knowing that their repayment behavior isn’t affecting you. A hot new benefit used to attract and retain employees is student loan repayment assistance. Some offer a fixed amount towards repayment, while others do a company match up to a certain dollar amount. Be sure to tell your soon-to-be-graduate to ask about this potential benefit as they embark on their job search. No, this isn’t exactly the popular adage, but it’s true. Student loans are notoriously difficult to eliminate outside of repaying them in full. Setting expectations up front can ensure that they are successful in the long run. Nearly 40% of student borrowers are expected to default on their student loans by 2023 and more than one million people default on their student loans annually. This is a daunting statistic for sure, but that’s where you come into play. 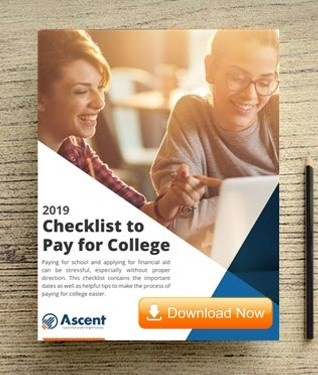 You can help set the expectations in the beginning so that they understand that neglecting student loan payments isn’t an option. Your student received the education and must repay their loans. If payments are difficult to manage, encourage them to work with their loan holders to find a manageable option. Ignoring the loans won’t make them go away, and loan servicers will work to find a repayment solution that works for all parties.